The Estée Lauder Pure Color Nail Lacquer Spring 2011 collection brings us 16 beautiful nail colours in classical hues and I'm very excited to show you 2 of the gorgeous colours today. 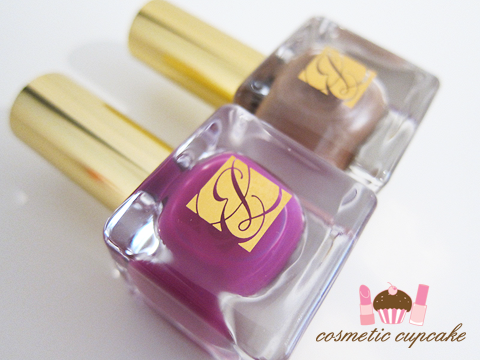 I have no preferences when it comes to nail polishes but there is something oh so very exciting about a luxury lacquer! "Avant-garde glamour coats the nails in chic, shiny splendor with the NEW Pure Color Nail Lacquer by Estée Lauder and Creative Makeup Director Tom Pecheux. A luxurious range of hues from perfect neutrals to smoky charcoals to romantic purples and riveting reds, delight the senses and turn nails into mini accessories to match any look. There are 8 in-line shades that set the stage for classic and sophisticated beauty while 8 additional, limited edition shades amp up the brilliance of the colour. The blendable coating stretches across the nail to create an even and smooth finish that stays true to colour throughout the duration of the wear and the high-performance formula does not dull, fade or streak." Estée Lauder nail polishes are Big 4 Free meaning they are free from formaldehyde, toluene, DBT, AND formaldehyde resin which is fantastic. They are packaged beautifully too in weighty square bottles with gold caps, very very luxurious and appealing. I love the elegance of all Estée Lauder packaging actually. On to the swatches now! Purple Passion: A bright purple creme. You all know I love a good purple creme and Purple Passion is no exception! 2 coats pictured. Sizzling Taupe: A gorgeous rich frosty taupe with a twist. There's a lovely shimmer through it making it unique from other taupes and I think a must have for any collection. It's very flattering and the perfect work appropriate shade. 2 coats pictured. Overall: These are my first Estée Lauder Pure Color Nail Lacquers and I am unbelievably impressed with them. The formula on these lacquers is one of the best (if not the best) I have ever have had the pleasure of trying. These applied like BUTTER. Oh so smooth and creamy melt in your mouth BUTTER!!!! They are highly pigmented only needing 2 coats for opacity and had I been more careful I would have only needed 1. They dry to a glossy finish and dry time is extremely quick - I was putting away groceries literally 10 minuntes after application and no dents whatsoever! I really enjoyed using the brush as it's firm but flexible and easy to control. The size gives excellent coverage with no cleanup needed whatsoever also. Like my wardrobe, I appreciate investing in a few classical pieces that work every time and these are the lacquer equivalent. They are well made, luxurious and they give you the ultimate confidence boost! Not everyone likes a bold colour so these shades are great for a more conservative yet still colourful look. While I would have liked to see a few more unique shades in the mix, they are a great basis for any nail collection. Unfortunately the disappointment is the price in Australia. These lacquers are amazing but at $38 a bottle it is a little more than what I can afford to purchase regularly. However you pay for quality and these are DEFINITELY worth every penny for the excellent pigmentation and formula. Estée Lauder Pure Color Nail Lacquers can be purchased online from the Estée Lauder store or at Myer and David Jones counters instore for $38. A huge thank you to Angela for sending me the above polishes to sample! I was sent the above products for my consideration but this in no way influenced my review in any way. As always, my reviews are my 100% honest opinion. 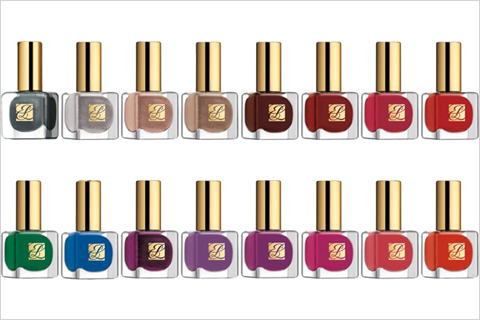 What do you think of the Estée Lauder Pure Color Nail Lacquer Spring 2011 collection? Ooooo I love both of them!! The browny gold is so unique!! They're both so beautiful! LOVE the colours! Wow, both colors look absolutely stunning! Color- and finish-wise! I love your nail swatches! Your nails are so perfect! So many pretty colours! You've just made me love Estee Lauder even more! Have you worn it to work, did it hold up well with washing your hands? I'm in love with the second one! !